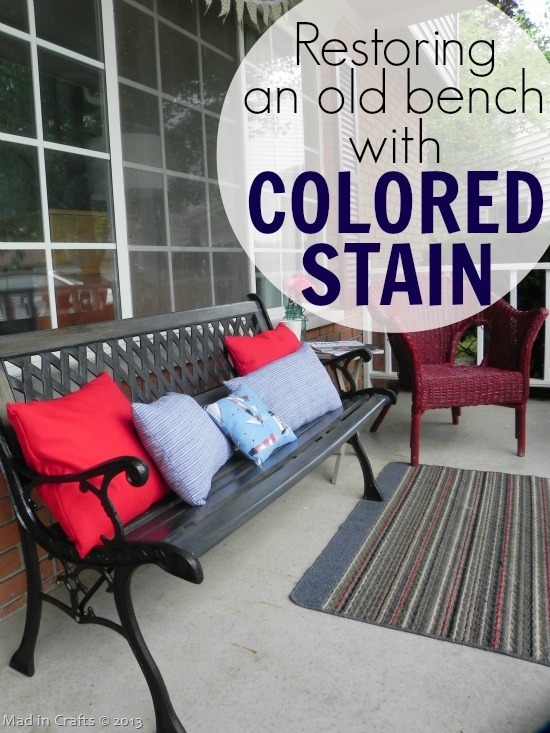 Yesterday, I showed you how easy it is to distress chalky finish paint with just a rag and water. 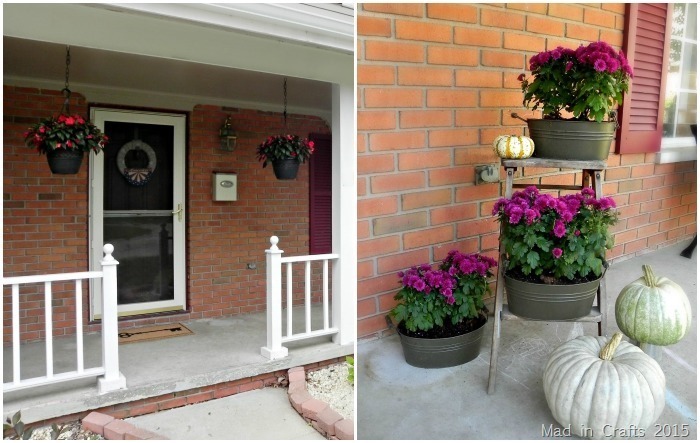 I decided to carry that technique over from my front porch plant stand to my front porch planters! 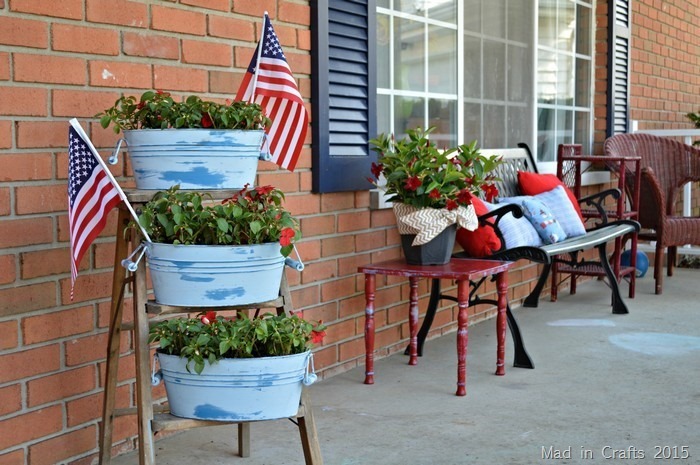 I used two shades of blue chalky finish paint to give our planters a new look for this summer. 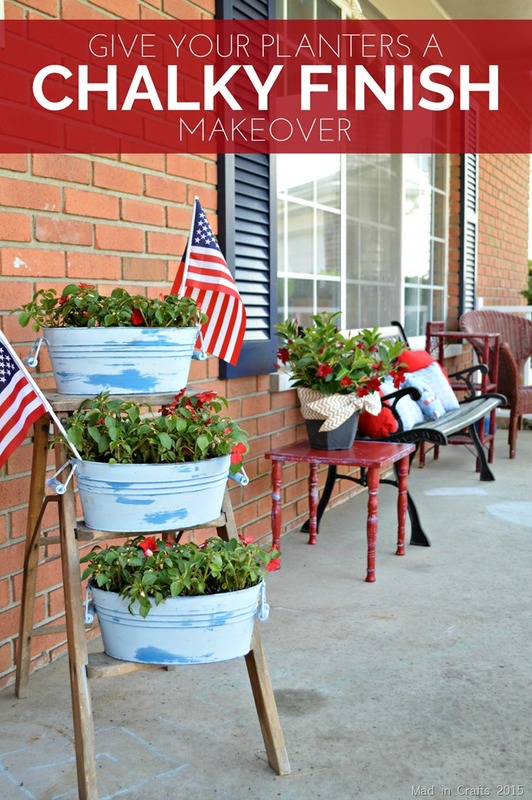 I am a saver, not a spender, so not only do I buy cheap planters for our flowers, I save them from year to year. 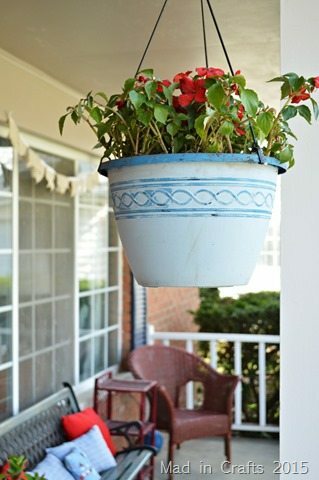 I bought pre-made hanging planters two years ago, saved the plastic planters over the winters, and replanted them each Spring. I bought the three bucket planters from the Target dollar spot several years ago, and I have gotten good use out of them since then. This year, I wanted a fresher, lighter look for the porch, so I used chalky finish paint to quickly give our old planters a makeover. These photos show you the traditional, vintage, Americana feel I was going for on our porch. I didn’t even bother with a rug this year, so the kids have more room to make chalk drawings on the concrete floor. 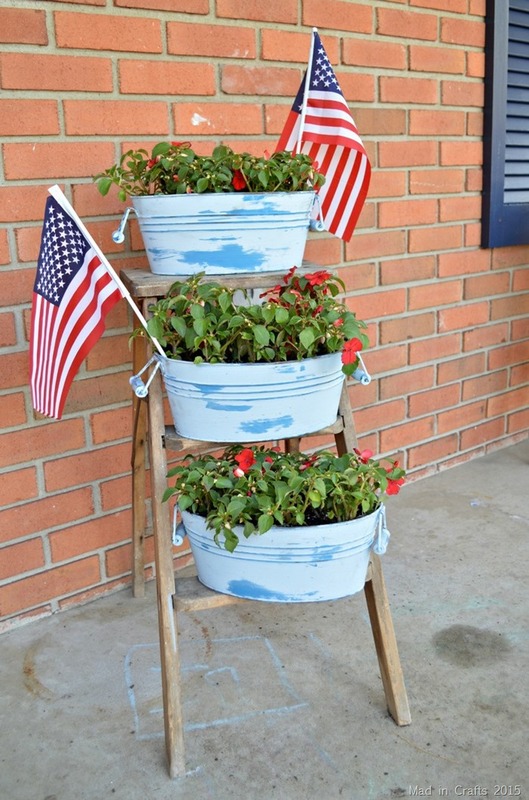 I first coated each planter with DecoArt Chalky Finish paint in Legacy and allowed that paint to dry. Next, I added a coat of chalky finish paint in Serene and waited about half an hour before I started the wet distressing technique. For the hanging planters, I really only worked on distressing the raised designs so they would stand out. 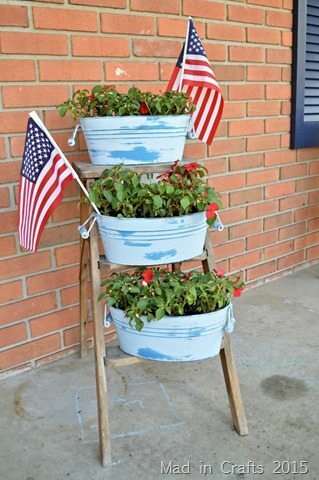 On these bucket planters, I wiped my wet rag over larger areas of the surface of the planter so that more of the base color would show through. This gives them more of a time-worm look. 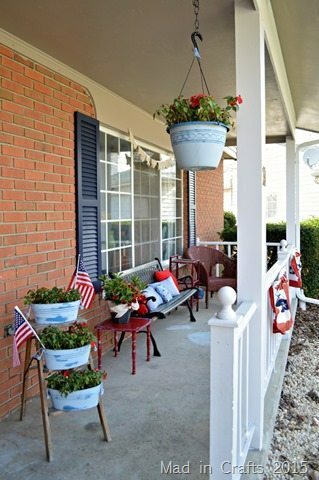 Usually I don’t get my front porch flowers out until June. 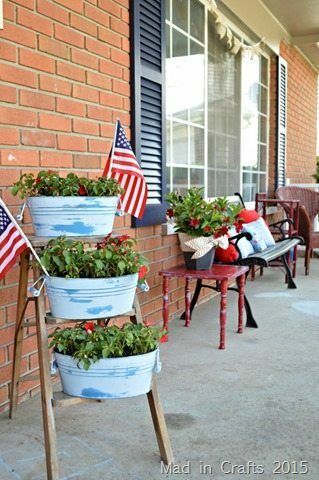 I am trying a new plant food for my planters this year, so I am hoping that they stay healthy and flower throughout the summer months. One of these years, I really do need to try out a new color scheme for the porch, but just look how happy and welcoming the red, white, and blue are! 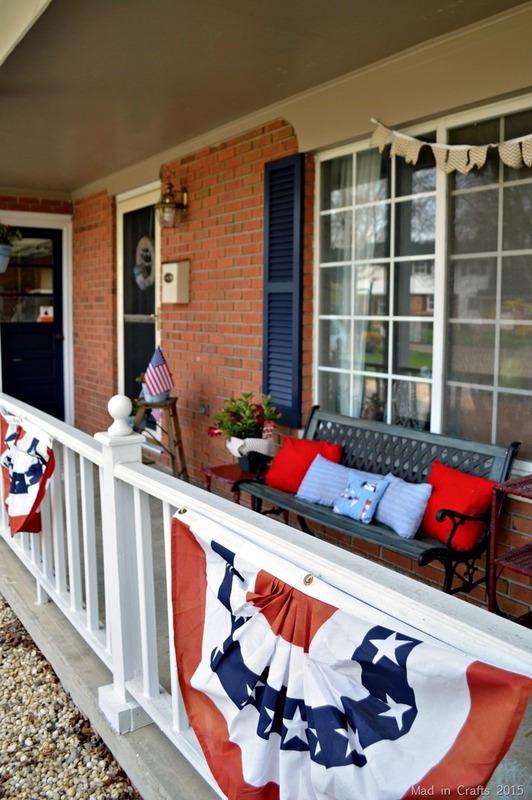 The new front door and shutters color only adds to the look. 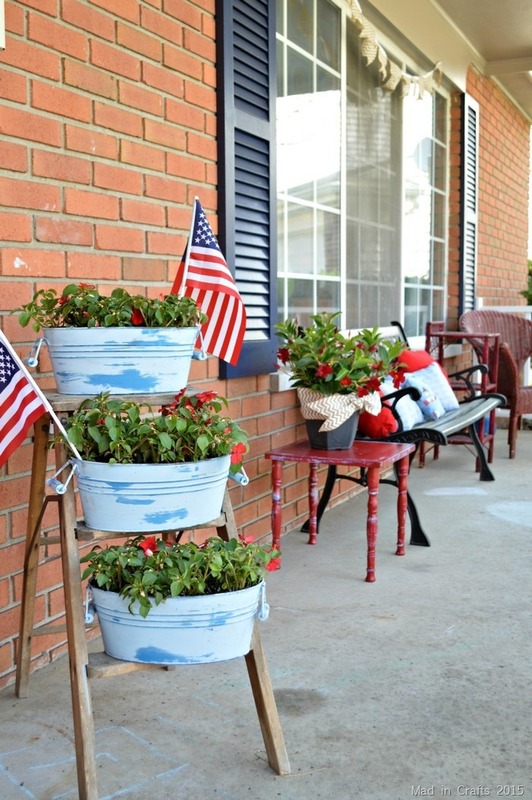 Have you started working on your summer curb appeal yet? 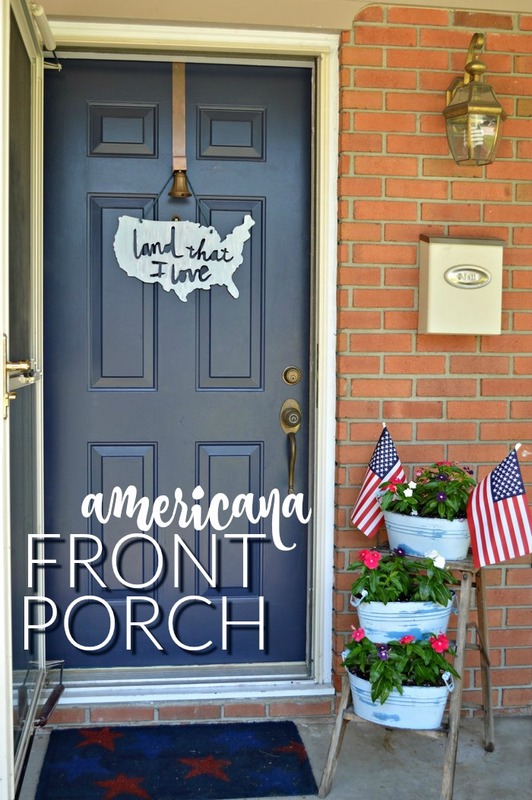 Seeing our neighborhood planting flowers and putting new paint on porches always signals the real beginning of Spring to me.